The “Born to Read” program began in 1990, the brain-child of the New Carlisle Literacy Exchange in the Gaspé and the project has been adapted many different ways since then. The main objective is to encourage young mothers to begin reading to their infants at a very early age, even before they are old enough to hold a book or turn a page themselves. The sooner they are introduced to the world of books, the better! Research has shown a marked improvement of school success amongst children who are exposed to reading early. 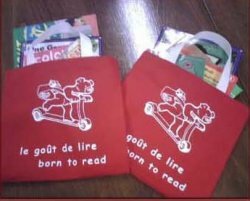 The born to read bags are made of sturdy cotton and will last for years. Several local Home and School Associations have adopted this activity as part of their literacy program, in conjunction with their school administration and Family Literacy Day, usually held on January 27. Mothers of new infants are invited to the school on a Sunday afternoon and are hosted in the library by the Home and School Association. These mothers can either be mothers with siblings already in the school or new mothers from the local community. Tables are set up with activities for the older siblings and refreshments are served. The school librarian reads some books to the Moms and their infants. Each child goes home with a Born to Read bag filled with literature for the parents on the importance of reading and five popular hard cover Board books, suitable for babies. Parents are given valuable information, are impressed with the dedication of the school community to reaching out and promoting literacy and the children are given a promising start on their home library. A win/win situation for all. For more information on the Born to Read program, and advice and suggestions on how to go about starting one at your own school, please contact Debi Brown info@qfhsa.org. Please see below for early childhood literacy ideas.